The Washington Examiner reports "top Republicans in Texas are sounding the alarm about 2020, warning President Trump could lose the usually reliably red state unless he devotes resources and attention to it typically reserved for electoral battlegrounds." Texas hasn't voted for a Democratic presidential nominee since Jimmy Carter won here by about 3% in 1976. Trump won the state by nine points in 2016. While not particularly close, it was the smallest GOP margin since Bob Dole's five point win here in 1996. 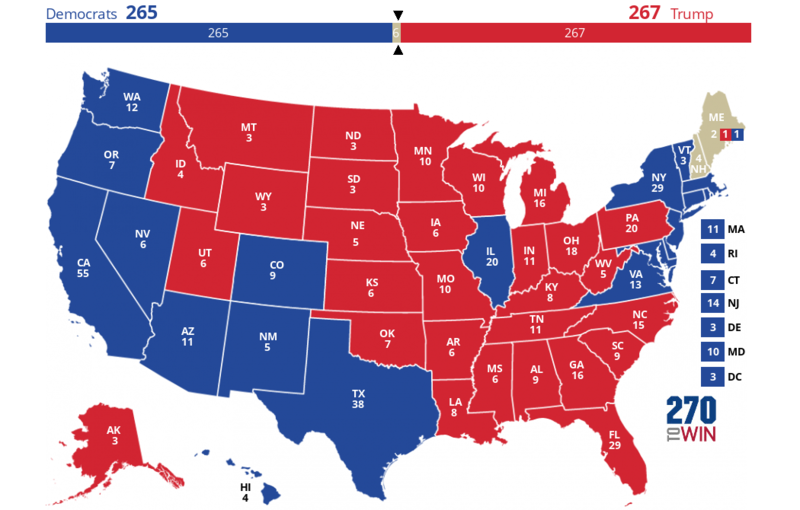 Could Trump win reelection if he were to lose Texas and its 38 electoral votes? Probably not, unless this was strictly a regional issue and he was able to offset it by building upon his 2016 realignment of the electoral map. That year, he flipped Michigan, Pennsylvania and Wisconsin, states that hadn't voted Democratic in a generation. In addition, he narrowly lost Minnesota, New Hampshire and Maine's at-large electoral votes. In the scenario below, we assume a loss in Texas correlates with a similar outcome in Arizona, making the entire Southwestern part of the country Democratic in 2020. However, Trump is able to offset this by carrying all his other 2016 states and winning Minnesota. This would leave the election to be decided - or perhaps end in a 269-269 tie - by the six electoral votes available in Maine and New Hampshire. Click or tap the map to create your own 2020 forecast.